Professor Victor Tadros of Warwick Law School has been made a Fellow of the British Academy in recognition of his work on the philosophy of criminal law, the philosophy of war, and legal, moral and political philosophy. Professor Tadros (pictured) is Professor of Criminal Law and Legal Theory at the University of Warwick. 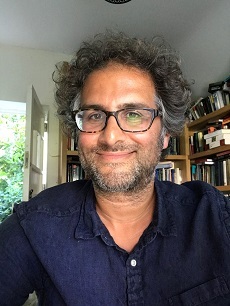 As a new British Academy Fellow, he joins an independent fellowship of more than 1400 world-leading scholars and researchers working in the humanities and social sciences. The Academy is also a funding body for research and a forum for debate and engagement. Current Fellows of the UK’s national academy for the humanities and social sciences include Dame Mary Beard, Sir Simon Schama and philosopher Baroness Onora O’Neill, while previous Fellows include Sir Winston Churchill, C.S Lewis, Seamus Heaney and Beatrice Webb. Professor Tadros said “‘I am delighted to have been elected a Fellow of the British Academy. It’s a great honour to join such distinguished company. Professor Sir David Cannadine, President of the British Academy, added: “I am delighted to welcome this year’s exceptionally talented new Fellows to the Academy. They bring a vast range of expertise, insights and experience to our most distinguished fellowship. Professor Victor Tadros joined Warwick Law School in 2006. His research interests are in criminal law, especially the philosophy of criminal law, terrorism law, the philosophy of criminal trials and the philosophy of punishment, at the domestic level, but also internationally. He also works on just war theory, and a range of fundamental issues in moral and political philosophy. His books include Criminal Responsibility (OUP, 2005), The Trial on Trial vol.3 (with Antony Duff, Lindsay Farmer and Sandra Marshall) (Hart, 2007) and The Ends of Harm: The Moral Foundations of Criminal Law (OUP, 2011) and Wrongs and Crimes (OUP, 2016). He has completed a three year Major Research Fellowship with the Leverhulme Trust, beginning in October 2014, to work on a project on just war theory entitled: To Do, To Die, To Reason Why: The Individual Ethics of Armed Conflict and is currently writing a book for OUP with the same title.